It may be difficult for you to imagine your sweet little housecat Hermione as a predatory jungle beast, hiding in the tall grass, hungrily waiting for a snake to slither along her path, grassor a little mouse to make the wrong turn and wind up in her sights. Or perhaps your little dachshund Schnitzel, charging through the forest like a wolf on the hunt. But our domesticated cats and dogs are the descendants of those feral animals, and will sometimes behave just like their ancestors in many ways. Have you ever seen Hermione nibble on the grass in your yard? What about Schnitzel – sometimes, after an exuberant roll in the muck, have you noticed him chowing down on blades of grass? 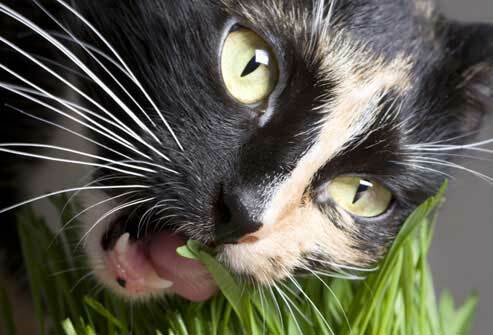 Some veterinarians and animal handlers surmise that cats and dogs may eat grass simply because they like the taste. This opinion is based entirely on observation and anecdotal information, of course. 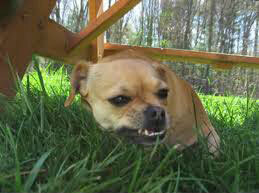 Both feral dogs and cats ate live prey, many of which themselves fed on grass. It is hypothesized that domestic cats and dogs, who no longer need to hunt for food, still retain the genetic association with grass to their “wild days and ways” and will seek it out as a normal part of their diets. Cats are very particular when it comes to preening and cleaning themselves, and use their tongues frequently during the day to lick themselves. While Hermione stays clean by doing this, she can also swallow a substantial amount of fur, which can then develop into a fur ball. The fur ball can lodge in her throat or digestive system, causing a blockage. 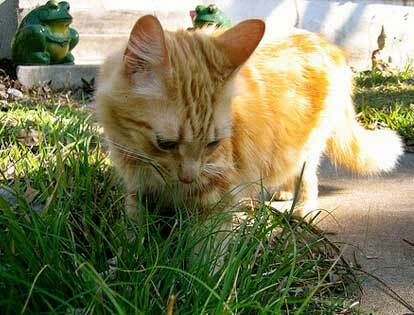 Cats may instinctively seek out grass in order to help rid themselves of fur balls. Because cats do not have the necessary enzymes to digest grass, they will vomit it up – hopefully along with the stuck fur ball! 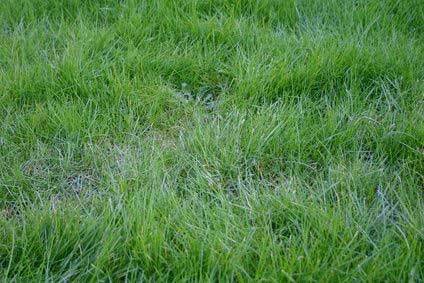 In layman’s terms, grass becomes ipecac for cats! Have you ever watched Hermione pounce on a bird in the garden on a lovely spring afternoon? She is demonstrating the same instinctive behaviour her ancestors exhibited while on the hunt for food. When the feral cat caught her prey, she would quickly eat it whole – bones, fur, and feathers! Unfortunately, not everything was digestible, and the wild cat might have sought out blades of grass in order to help her regurgitate the “leftovers”. Dogs are omnivores and scavengers, and their wild ancestors hunted and ate prey whole, too, just like the cats. Perhaps they also nibbled on grass to help rid themselves of the indigestible remnants of their food. Wild dogs ate whatever they could forage, and then might find themselves in distress, with very upset tummies. If Schnitzel has consumed something bad for him, you might find him galloping out the door, making a beeline for some tender stalks of grass, stuffing himself until he purges and alleviates his discomfort. 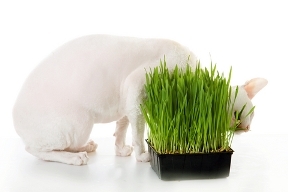 Female cats and dogs may seek out grasses prior to oestrus, as the additional vitamins and minerals will assist in the healthy development of their embryos. Some pet stores sell grasses as nutritional aids. For example oat grass, (whether dried in powder form, or freshly-cut stalks), is well tolerated by most animals, and should not trigger an allergic reaction. An interesting theory states that animals seek out young, green shoots containing chlorophyll in order to sweeten and lessen their odours. Feral cats and dogs often give birth in the spring, and chlorophyll from the new green blades might help their newborns mask their scent, and thus avoid being detected by an animal hunting for food. 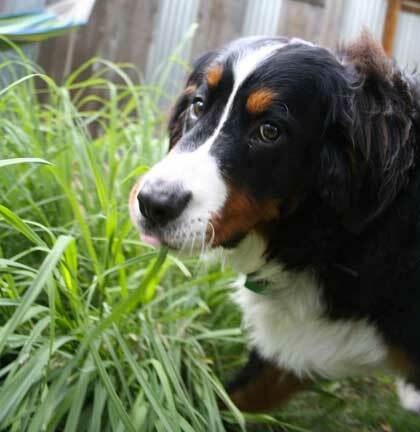 There is one more reason why your pet might be eating grass—a condition called “pica”. Defined as an obsessive-compulsive disorder, this condition may have an organic cause (ranging from a diet lacking in a few nutrients to a severe deficiency in the animal) or inorganic (stress or boredom-induced). If you notice that your pet has begun to eat non-food and/or indigestible items, such as plastics, string, yarn, grasses, etc., he might be suffering from pica. Pica is the manifestation of a larger problem, and it is important to find the cause of this problem and treat it quickly. Pica can cause physical harm to your pet (a foreign object can become lodged in the animal’s system, requiring emergency surgical removal), or chronic behavioural problems, requiring medication and/or psychological treatment. A little salad with a meal is no cause for worry! However, if you notice your pet constantly needs grass, has urgent and consistent problems eating and digesting, it’s time to see your veterinarian. 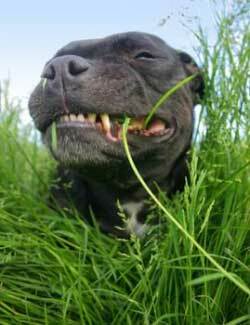 Never allow your pet to eat grass from a field treated with herbicides, pesticides, or fertilizers. These products are toxic, and while a few blades may not be a sufficient dose to be poisonous, consistent eating will definitely cause a dangerous build-up in your pet’s system. Be very careful if you have houseplants and are introducing pets to your home, or if you are considering bringing a new plant into a house with animals. Your cats and dogs may naturally want to nibble on the plant’s leaves, and some plants are very toxic and even lethal to cats and dogs. Your daily interactions with your pets give you a unique perspective on what is normal for them. Cats and dogs will naturally graze on grass from time to time, and you should be confident that your pets are using their instinctive behaviour for healthy and beneficial reasons.